"On the originality of Schumann, Part 1"
There is a concert that ranks among my personal richest experiences of the last several years. 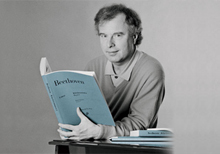 It was a Schumann matinee given by pianist András Schiff in the excellent and lovely “Reitstadl” in Neumarkt, Bavaria in January 2009. The concert was recorded and will be published on CD by ECM (planned for the beginning of 2011). It was my honour and my pleasure to talk to this exceptional musician about Schumann, and I did this exclusively for you, dear readers of the Schumann Forum. The central issue of our conversation was the question whether there is an unmistakable “Schumann sound” and whether it is at all possible to grasp and describe it. You can listen to excerpts of the conversation here. It was conducted in German. Those among you who do not speak German will be happy to read the summary that I wrote up in German and which has also been translated into English. Because Mr Schiff specially remarked on the beginning of the Fantasie in C major op. 17 I am including a link to the Henle Urtext edition (just click on the cover image for more information). In case you missed it at the time, I would also like to point you to the September 15 entry on the Schumann Forum. Finally, we came to speak on Schumann’s late works which András Schiff very much reveres, but other pianists avoid like a curse. Why so? At the end of our conversation Maestro Schiff returned to the special value of the first versions of Schumann’s piano works that he feels are in some cases better, and even more inspired, than the later versions that Schumann approved. Mr Schiff attributes this continuous desire to improve finished works to Schumann’s emotional instability and his lifelong insecurities.